Ray Hitchcock of Cambridgeport has been a champion for the Pinnacle Association. He passed from this world on November 20, 2016, concluding a seven-year battle with ALS that he managed with dignity, humor, and Adrienne – his wife, companion, and serene caretaker. A native Vermonter, born in Springfield, Eagle Scout, active outdoorsman, and professional forester who became Assistant Commissioner of Operations and then Interim Commissioner at Minnesota’s Department of Natural Resources, Ray moved back to Vermont upon his retirement. He is especially remembered by those who worked with him for his steady help with Athens Dome projects: including purchase of the Lake property, designing of connecting Pinnacle trails, and shepherding the Act 250 permitting process from application through to reporting its completion this fall. 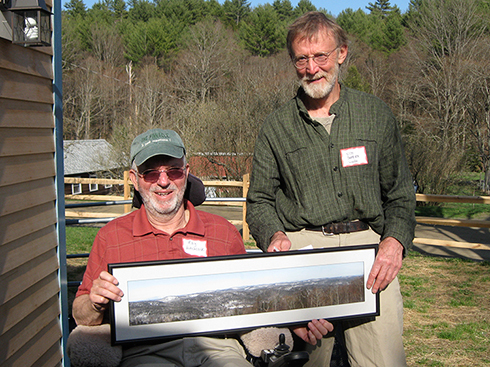 In 2013, Ray Hitchcock was honored as WHPA’s Volunteer of the Year and given a picture of Paul’s Ledges by Pinnacle Trustee Silos Roberts, at right, as a token of appreciation. Ray’s help was important and varied. Especially valuable were his attention to detail and understanding of governmental requirements and regulations. Honored for his research and work on Athens Dome projects, he also wrote the application for WHPA to become formally recognized in the Vermont Trail System, designed information pages for the Athens Dome and Windmill Ridge maps, and suggested proper handicapped access to appropriate Pinnacle properties. 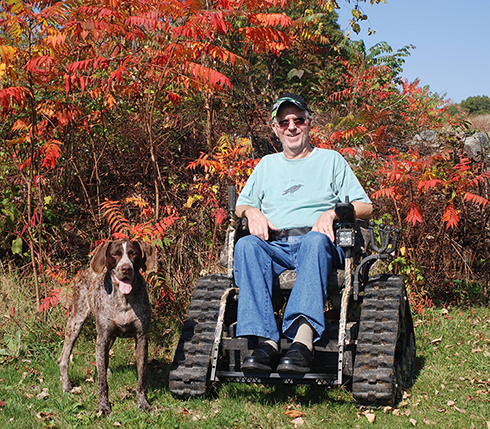 Ray Hitchcock with his dog and amazing Tracker wheelchair. Ray's light-hearted humor sparked much laughter at meetings, and the minutes he took as secretary of WHPA’s Athens Dome at Grafton Conservation Committee were a witty delight. His courage inspired several adventurous trail outings with Pinnacle friends on rugged footpaths with his Tracker wheelchair. His own physical limitations made him acutely aware of challenges others might face, and Ray mentored us all about the ways the Pinnacle Association could enhance its trail system to make it possible for those with handicaps to have access to trails and the outdoors. Those of us who are involved with the Pinnacle Association will be among the many who will miss him.